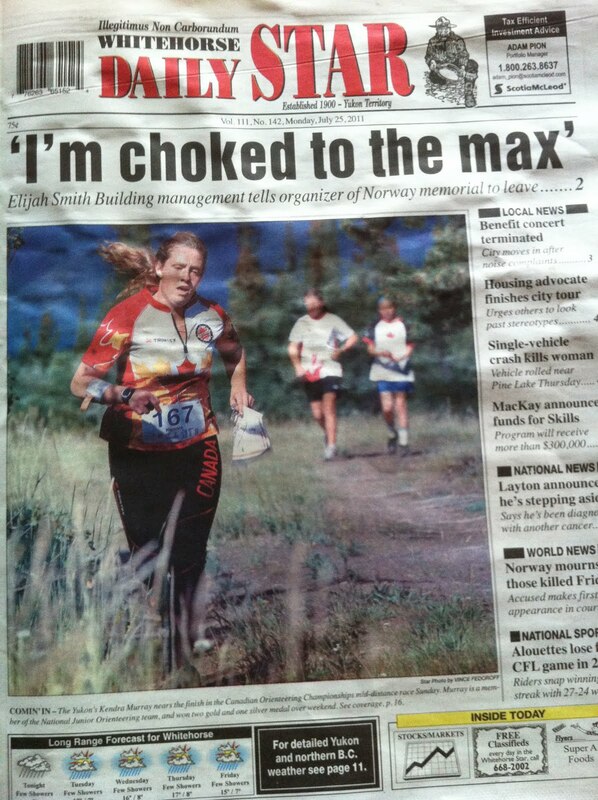 on the cover of the hardcopy version of today's Whitehorse Star. This picture of Graeme Rennie finishing today's Western Canadian Champs sprint appeared on the cover of today's Yukon News. 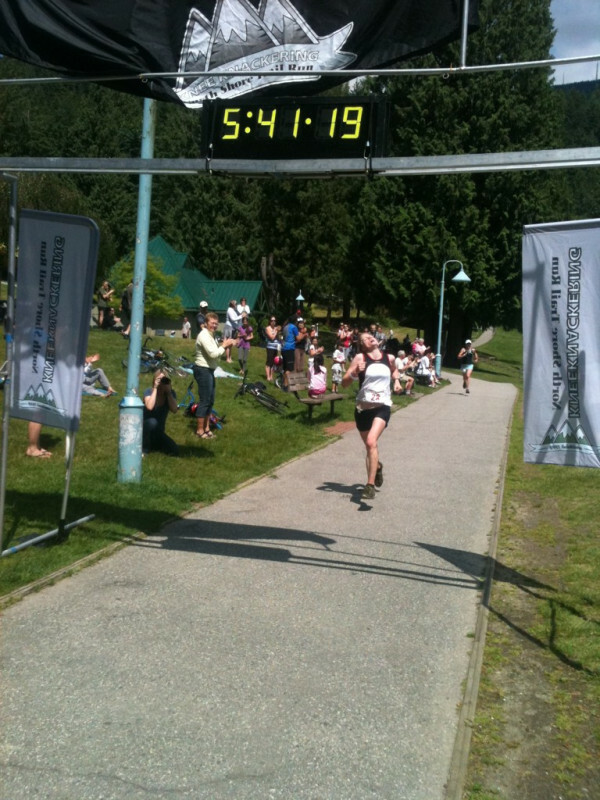 Louise Oram, national team member, was the fastest female in the yesterday's Knee Knacker - a 30 mile trail race in North Vancouver. This trail run is a challenging 30-mile foot race along the Baden-Powell Centennial Trail from Horseshoe Bay to Deep Cove. Runners climb 8,000 feet and descend another 8,300 feet in the process. 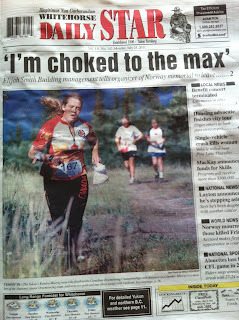 This was Louise's first ultra-distance trail race. She finished in 5:41:19, 5 seconds ahead of #2. Here's a video of the sprint to the finish. You can read her race report on her training log. 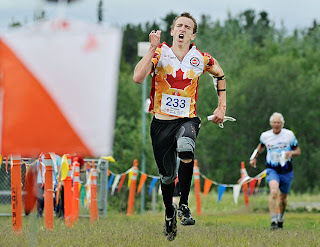 And a shout out to orienteer, Brian May, of Salmon Arm who was 6th overall in the race - in a time of 5:39:11. Not bad for an old guy :-) Brian told me that he was very happy not to get run down by Louise as he was fading fast towards the end. 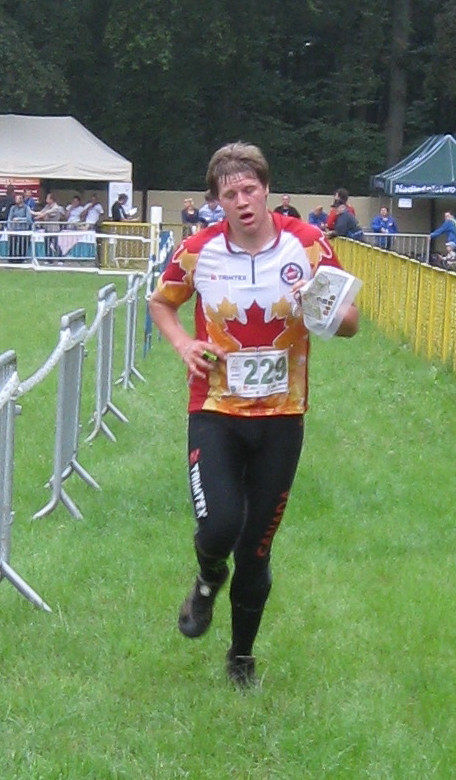 The relay was the final event for JWOC 2011. 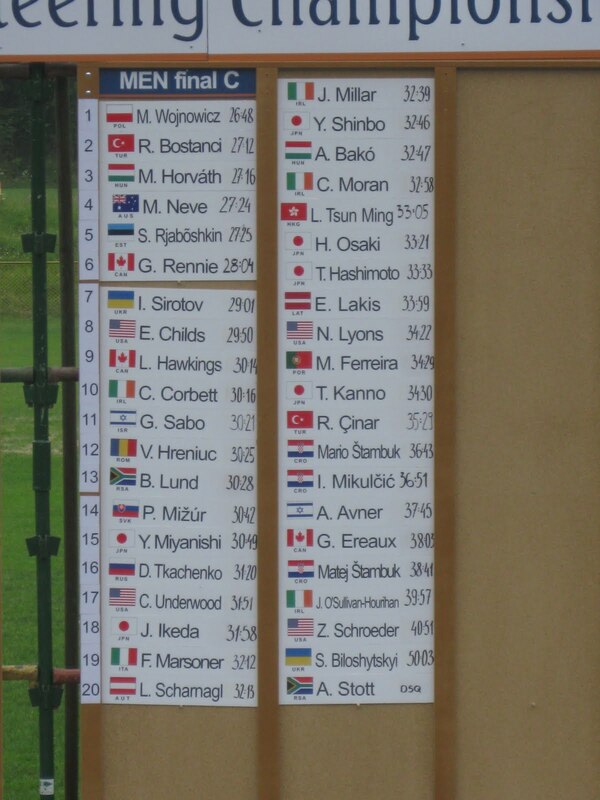 Graeme led the Canadian men's team in the mass start followed by Graham and Lee. For the first time ever, Canada had a women's team in the relay with Tori in the mass start followed by Kendra and Emily K.
Team France's Emilie Backschneider led a mixed France/Canada team with Emily R. the second runner and Molly finishing. The women relay was won by the Swedish 1st team and it was a huge surprise for the home town Polish Team taking the men's relay gold medal. Emily R. just after the hand-off to Molly at the exchange. 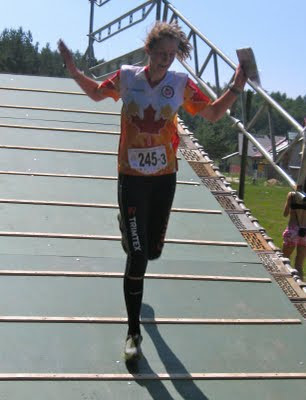 Molly screaming down the bridge in the finish chute. Tori handing off to Kendra. Kendra finishing the 2nd map handing off to Emily. Emily K. finishing the 3rd leg. Graeme handing Graham the second map. Graham sending Lee off on the final loop. Lee finishing off JWOC 2011 for Team Canada. It's going to be a party in Poland tonight!! 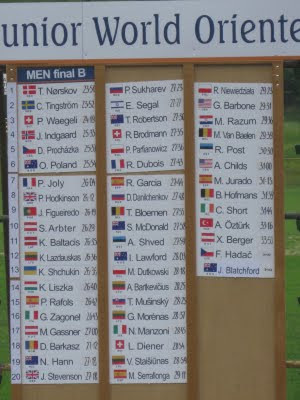 July 7, 2011 will go down in orientering history as the first time that a triple gold was awarded for an IOF event. Three men tied for first in the middle distance final all with a time of 25:43. Not to be outdone the young Danish star, Ida bobach, won her third JWOC gold of the 2011 championships. She now has won more JWOC medals than any other woman in history. The orienteering three concept as applied to our Canadian juniors is that we had three competitors in the same classes. 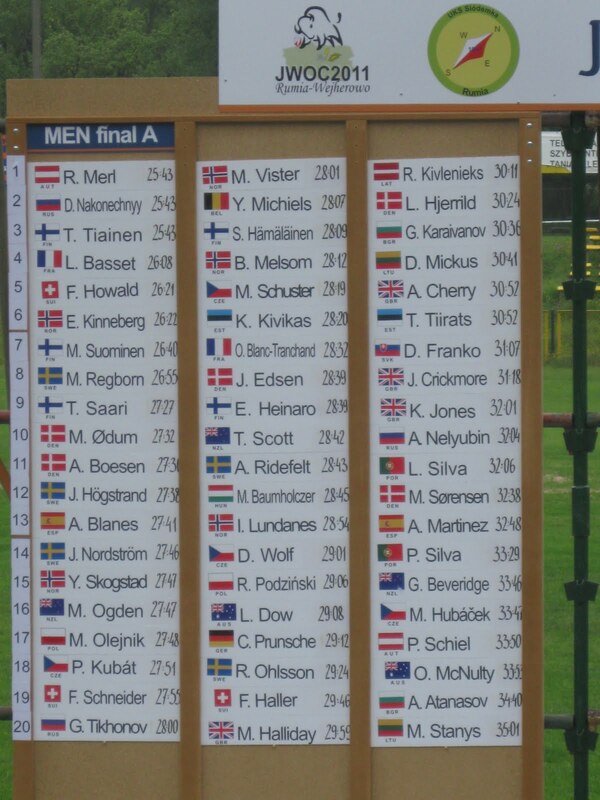 Three men in the C final and three women in the B final. Overall the Canadians had a better day and you can see details on this elsewhere in the blog. Emily Kemp # 523 came in 22 in the A final! If anything we can all say "we were there" on the day orienteering history was made. 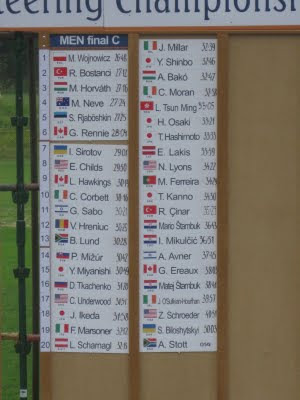 Team Canada had good results at the Middle Final with Emily K. finishing 22nd out of 60 starts in the women's A, Emily R. 45th, Kendra 57th and Tori 65th out of 70 starts in the women's B.
Graeme and Lee finished very strongly at 6th and 9th, and Graham 36th out of 41 starts in the men's C Final. Graeme burning up the finish chute. Tori cruising through the spectator control. 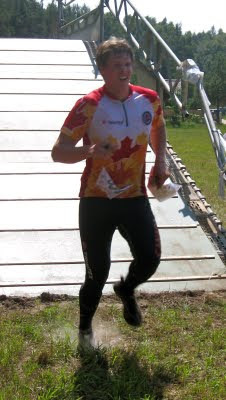 Lee charging through the finish chute. 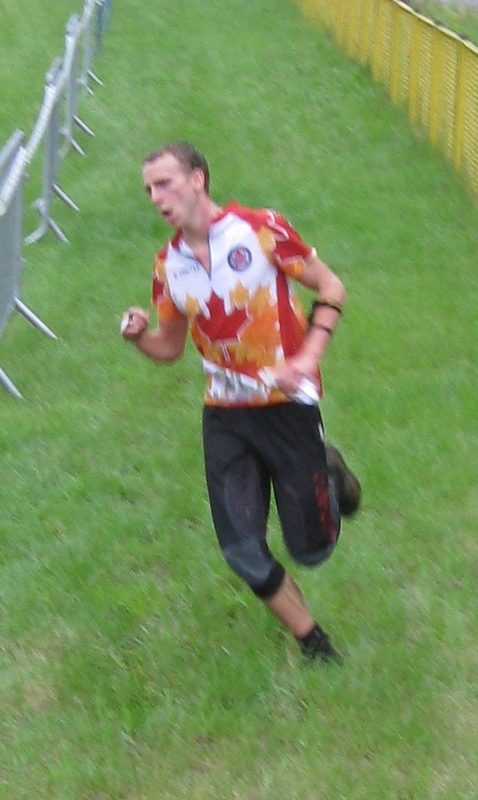 Graham sprinting into the final stretch of the finish. Emily K. emptying the tank in the finish chute. Kendra driving out of the spectator control. 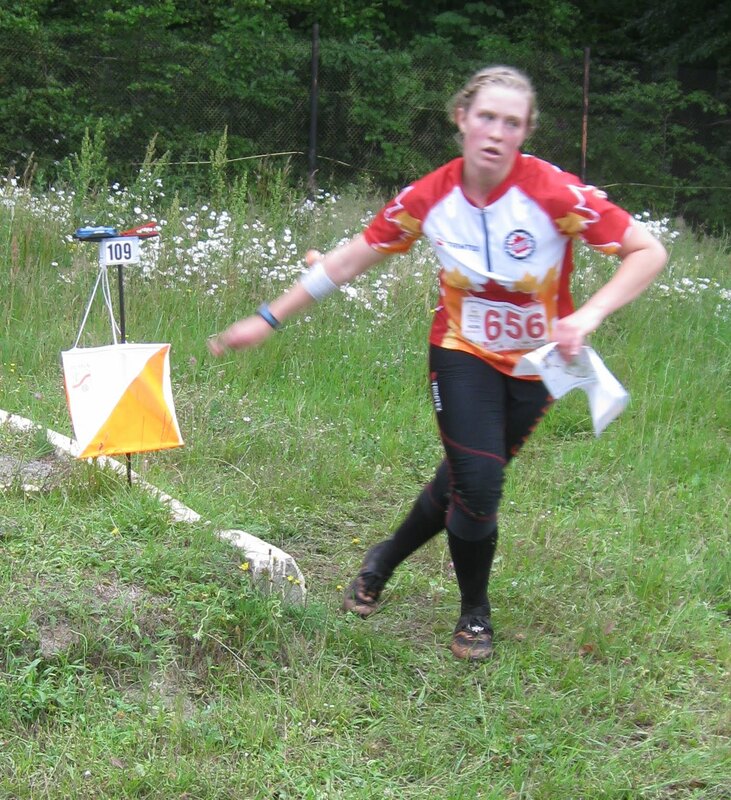 Kendra arrived at control #18 to find four other JWOC runners searching for the flag in the swampy re-entrant. Although not mapped as green woods, the re-entrant was quite thick with limited visibility. Kendra attacked the control from above by climbing the side of the spur. The other JWOC runners saw that she had punched the control and immediately followed. 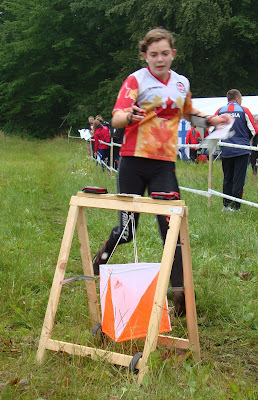 Kendra lead the train through the remaining two controls and finish shoot, a distance of 750 metres. Now that's an example of a competitive spirit!! Kendra at the Go control. Kendra driving to the finish line. The JWOC Competition Arena and the last 150 metres of the long Long finish shoot. 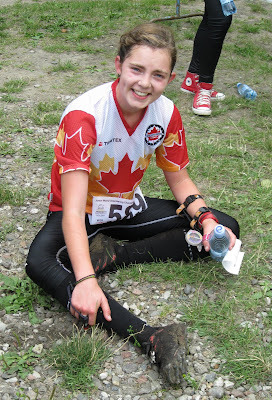 It was a great day for Emily K. in the long event finishing 13th overall with a time of 1:03:48 on the 7.7 km course. 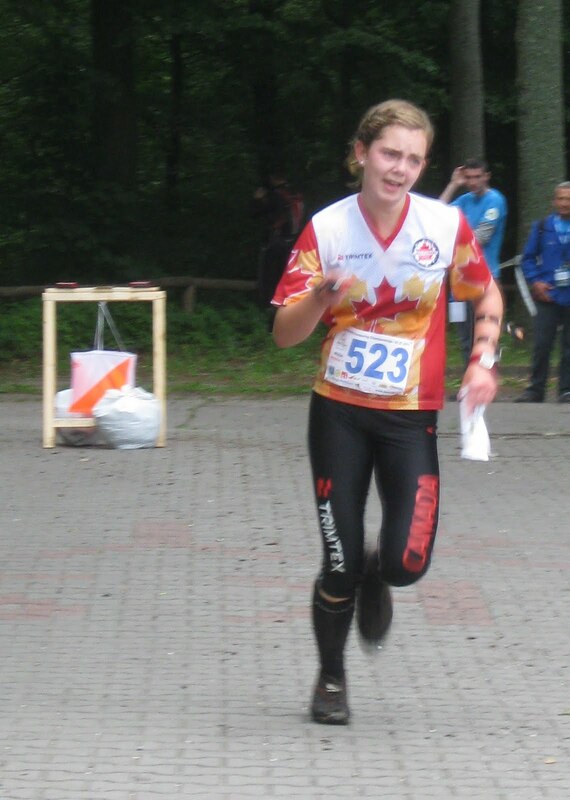 Demark's orienteering superstar, Ida Bobach, won her second gold in as many events with a time of 55:23. 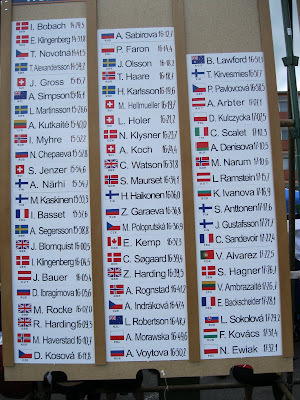 There were 12 women who finished between 1:03:43 and 104:56. Emily resting at the finish line. Graeme cheering on Emily in the finish chute. It was a surprise win by France’s Lucus Basset in the men’s sprint with a time of 15:07 on the 2.9 km course. 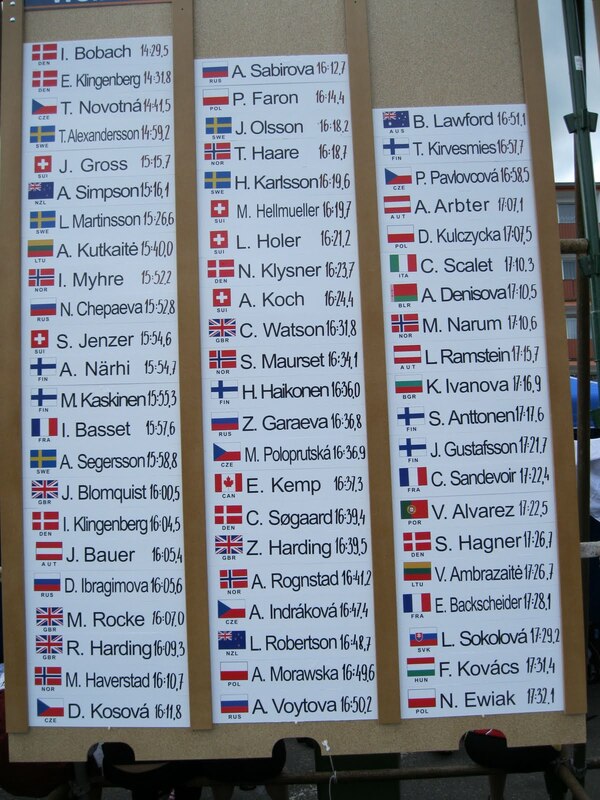 Exceptionally, a Norwegian was the only Scandinavian to finish in the top ten in tenth place. Ida Bobach of Denmark is a repeat gold medalist on the women’s 2.5 km course with a time of 14:29 with fellow teammate Emma Klingenberg just 2 seconds behind her. 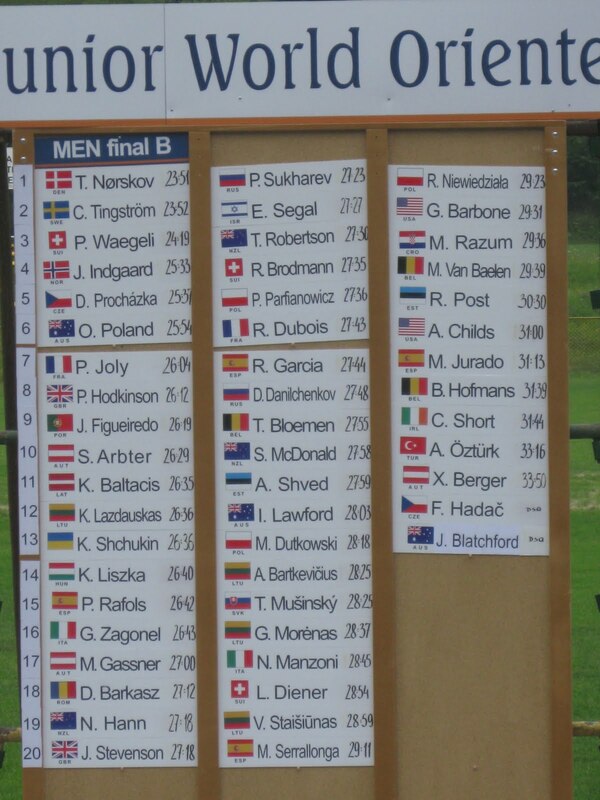 It is expected that Bobach will deliver strong performances at the long and middle events as well. For Team Canada, Emily K. had her best sprint finishing at JWOC with at time of 16:37 to put her in 38th place out of 130 women. Graeme had an excellent race and finished 106th out of 157. He was unfortunately caught in the trap set between controls 13 and 14 on the men’s course. It cost him about 25 seconds. 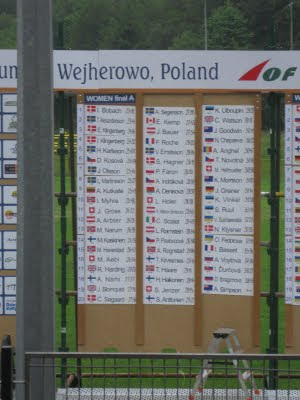 Tove Alexandersson of Sweden lost a spot on the podium, and potentially the gold medal, in the same trap between controls 16 and 17 on the women’s course. 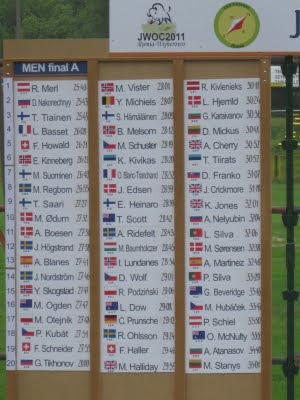 Today is the long event with the men running 11.0 km with 410 metres of climb and 23 controls. The expected winning time is 74 minutes. 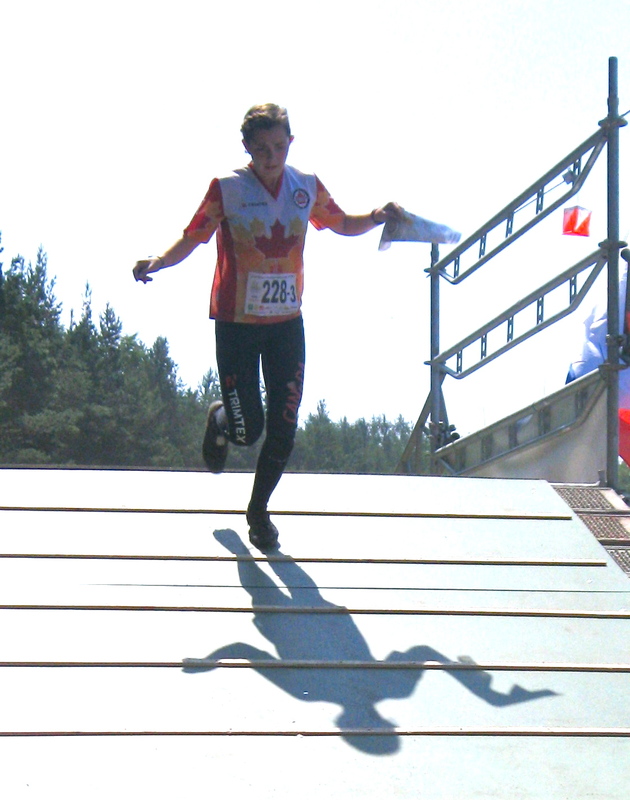 The women are running 7.7 km, 285 metres of climb and 20 controls. 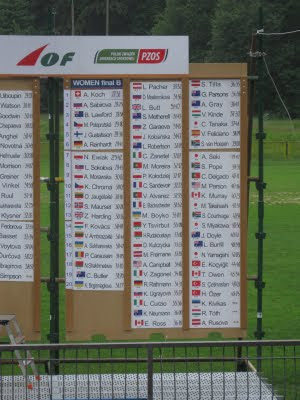 The winning time for the women should be about 57 minutes. Both the men’s and women’s courses will have butterfly loops which forks the runners thus preventing runners following each other. Women's Finish Board with Emily in 38th position. 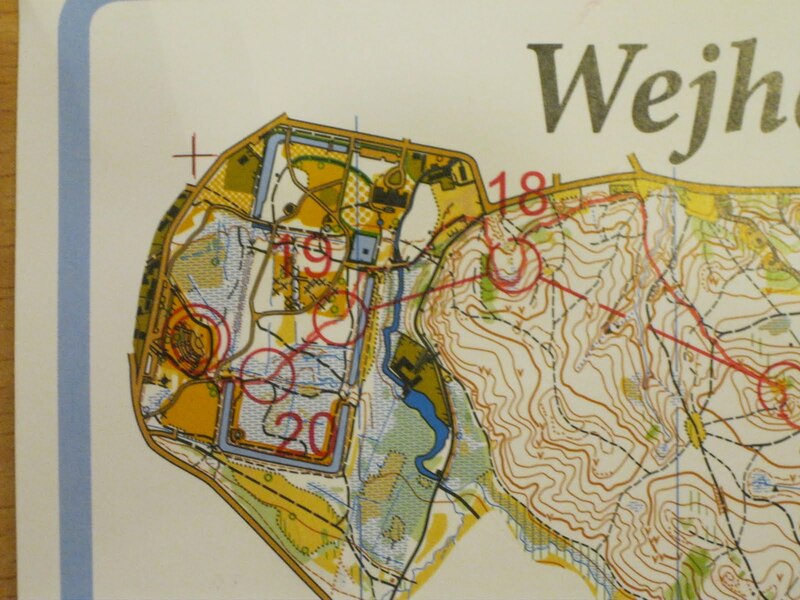 JWOC 2011 starts today with the sprint race in the town of Lebork 30 km west of Wejherowo. Our athletes are ready and they are pumped!! The men's race will be 2.9 km with 35 metres of climb and 23 controls. The women's course will be 2.5 km with 30 metres of climb and 22 controls. 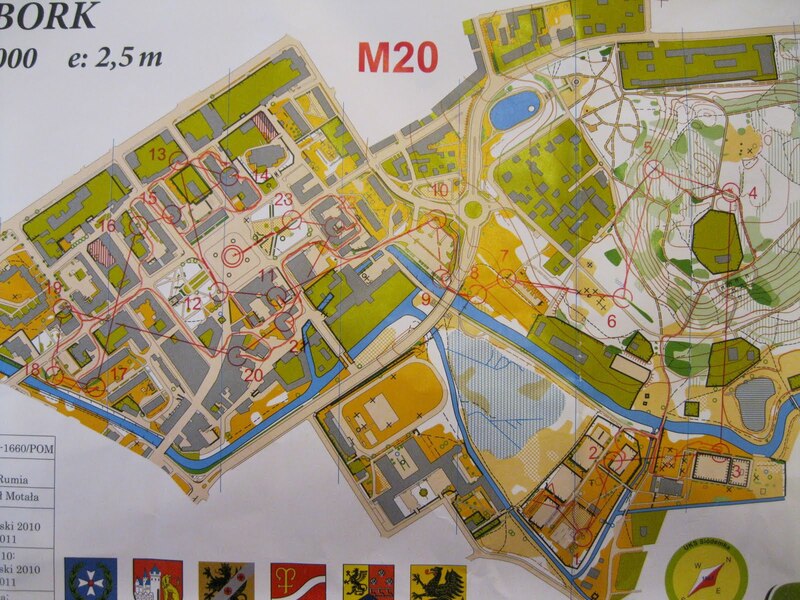 The courses are set in mostly urban terrain with about 15% of the race in forest. Team Canada in the Official Opening Parade being lead by Angilika from Wejherowo. The Wejherowo young people's choir greeting us in the town square. Team Canada singing along to the JWOC 2011 Theme Song. Today was our last day of training before the festivities begin with the JWOC official opening in the town square of Wejherowo, Poland on Saturday evening. 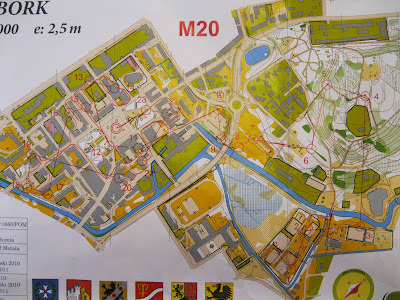 The races start with the sprint on Sunday in the village of Lebork. This year will mark the first time that we have five women representing Canada in the competition. JWOC 2011 will be Emily R.'s second competition. Coach Carol has been encouraging our juniors to keep their heads up and trust their compass'. Emily K. is the long-timer on the women's team with Poland being her 4th JWOC in as many years...and she still has one more to go. 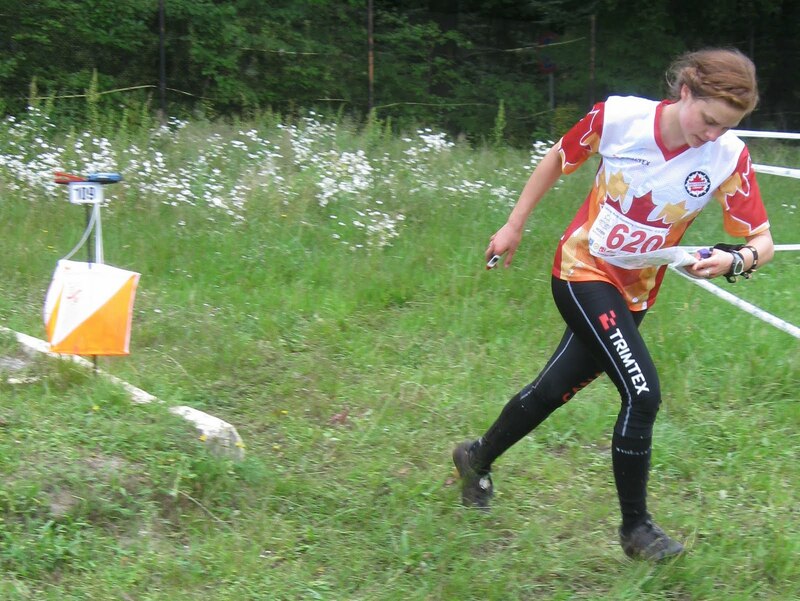 Emily is charging into one of the dastardly pits on the side of a hill. Tori's first JWOC training has been an incredible experience. 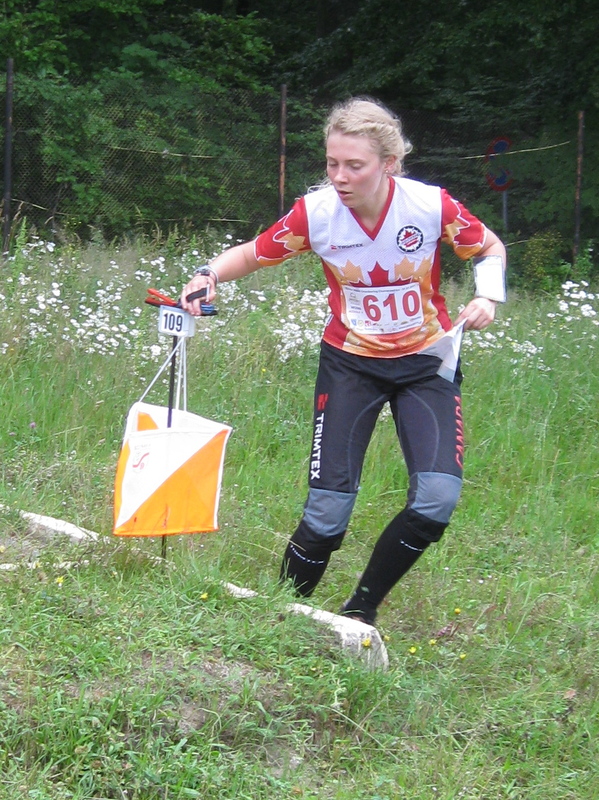 She has focused on perfecting her orienteering skills. She has enjoyed meeting the friendly locals. Molly, our youngest member of the women's team, has been honing her navigational skills. 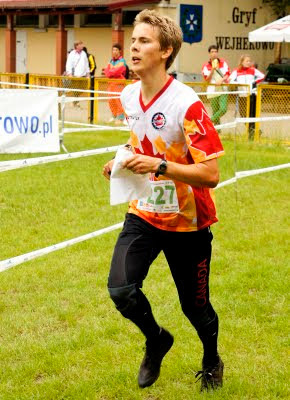 Her steady and thoughtful orienteering style will likely pay huge dividends here in Poland. 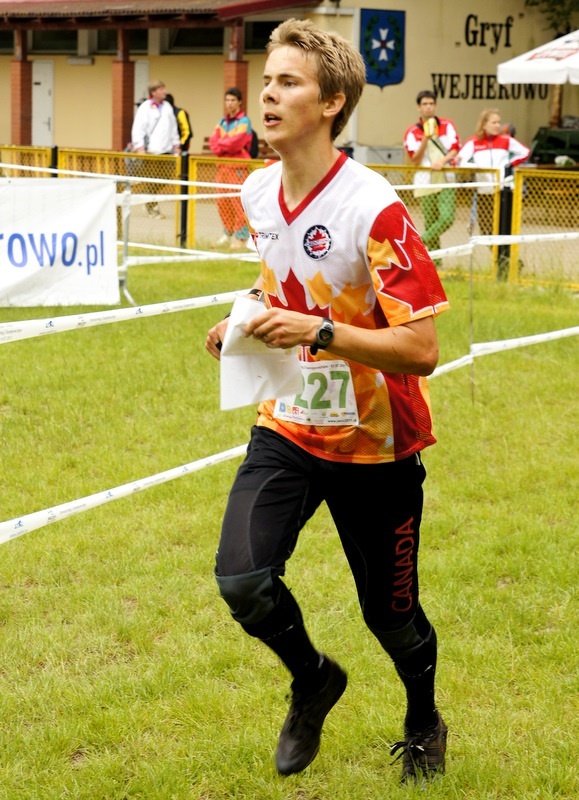 Kendra, our third rookie on the team, will use her incredible fitness from XC skiing to charge up these Polish hills. 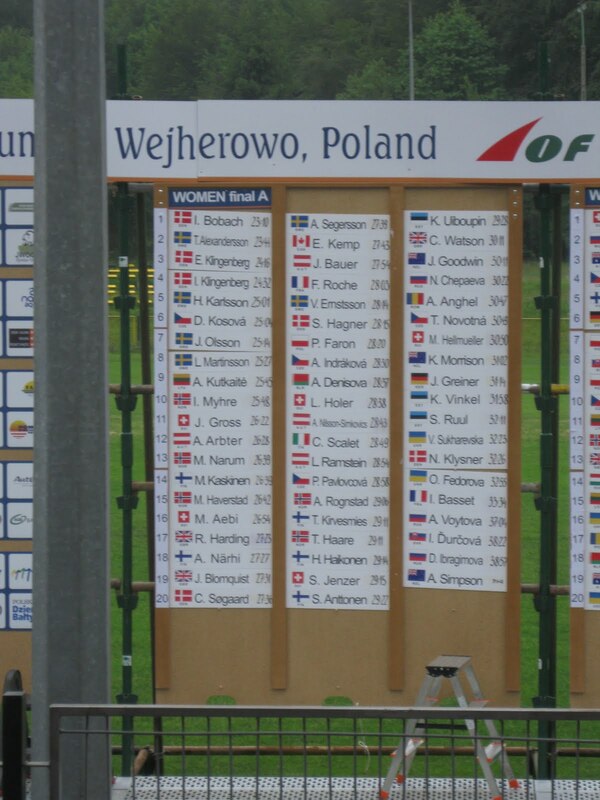 You can hear her fellow Yukoner's cheering her on all the way over here in Wejherowo! !